Netgear has been enjoying market success with their Orbi line of mesh Wi-Fi routers. 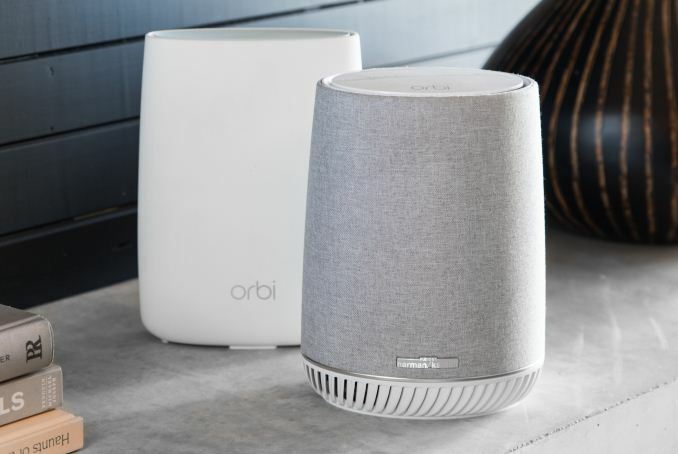 Today, they are launching the Orbi Voice - a mesh Wi-Fi node compatible with existing Orbi kits, that also doubles up as a premium smart speaker with Alexa capabilities. The Orbi kits have been very successful in the market, and Netgear's aim is to keep adding features on top of the existing functionality to widen the target market for the product line. On one hand, we have subscription-based services like Disney Circle that allow for recurring revenue without the sale of new hardware. On the other, we have increased functionality that adds hardware features, like the integrated cable modem in the Cable Orbi launched a few months back. The Orbi Voice falls under the second category. Smart speakers have made it big in the market over the last year or so, with consumers opting to largely ignore the privacy concerns associated with always-listening devices in favor of the convenience and novelty factor. 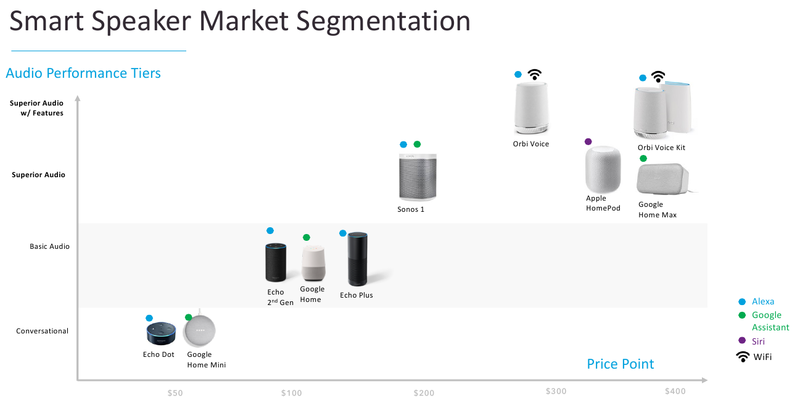 The current smart speaker market is somewhat analogous to the Wi-Fi market in terms of market segmentation. On the Wi-Fi side, we have basic wireless routers, and Wi-Fi systems / mesh kits build on top of that. Vendors are then able to tag on advanced features and services on top of these Wi-Fi systems. On the smart speakers side, we have devices like the Amazon Echo Dot, which act more like voice assistants for conversational audio. Moving up the value chain, we have speakers offering basic music quality, while the Apple HomePod and the like fall under the premium audio category. Netgear's Orbi Voice aims to deliver premium audio along with all the value additions possible in a mesh Wi-Fi system. 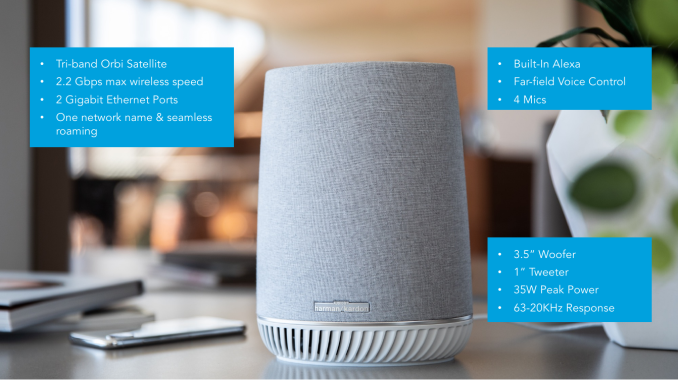 With Netgear's core expertise being in the Wi-Fi area, the audio segment of the Orbi Voice is handled by Harman / Kardon. The companies have worked together to minimize the interference between the speakers and the wireless antennae. The Orbi Voice with Built-In Alexa is certified by Amazon for use with US, UK, and Australian English, as well as German and French. The device comes with ring LEDs to convey the Wi-Fi and Alexa status, and also comes with the standard buttons for waking, speaker, and microphone muting. The device also supports various music services such as Spotify, Pandora, Amazon Music, Tune-In, Deezer, iHeart Radio etc. Current Orbi owners interested in the Orbi Voice can purchase the Orbi Voice satellite (the AC2200 RBS40V, $300) which can seamlessly plug into their existing Orbi network. The Orbi Voice kit (RBK50V, $430) is an AC3000 system with the higher-end Orbi master (non-speaker variety) and the Orbi Voice satellite bundled together. The products will be available for purchase in September 2018. The wireless router is an indispensable part of the modern household. As the number of connected devices in the home increases, it makes sense to integrate more of their functionality into the wireless router itself. In fact, many vendors are trying to move the home automation / smart home hub into the router, but, the growth in that market has been a bit slow. On the other hand, smart speakers have taken the market by storm and are enjoying unexpected success. The Orbi Voice launch shows that Netgear has been able to respond quickly to take advantage of this recent trend. It also helps keep their Orbi juggernaut rolling. If you had asked me 5 years ago what the most saturated ecosystem would be in 2018, I would have NEVER said "smart speakers"
At least Netgear had the intelligence to ask an audio company to design the speaker.